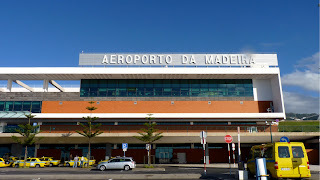 For someone whose recent travel schedule has included doing time at crowded airports like JFK , Narita, and Frankfurt, what a treat to arrive at Madeira's International Airport outside of Funchal. From its exceptional runway (more about that shortly) to its floor to ceiling windows overlooking the ocean, this is an airport that announces to travelers "you have arrived someplace special." Okay, so there's no really bad view in Madeira, a Portuguese island of 286 square miles smack dab in the middle of the north Atlantic. But the Madeirans have gone to an award-winning extreme to leverage the mountains and the sea, creating an easily-accessible, easy-to-travel-around tourist destination where there is no turn that doesn't present another colorful garden, another charming view. 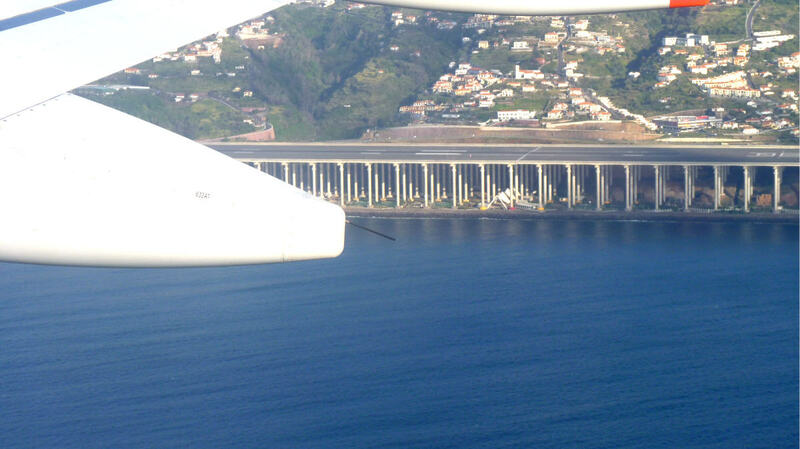 But I can't get out to the island's botanical garden until I have shared with you this photo of Funchal airport's 9,000 foot runway, perched on 180 pillars nearly 300 feet in the air and supported by footings 180 feet deep. Not only does this engineering marvel create a runway for the largest jumbo jets where previously there was only water, it is nestled between mountain and ocean, so that its profile blends into the spectacular scenery. Its a hair-raising landing to be sure. 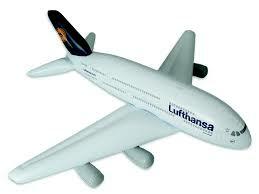 My TAP Airbus rocked and rolled on approach. Wikipedia says its been ranked the 9th most dangerous airport in the world by the History Channel 's program Most Extreme Airports . But where I really felt scared was not at the airport, it was as my Charming Hotels guide Paula Santos and I boarded the island's other aerial transportation system; the passenger ropeway, called the Telefericos. Yes, I'm a baby. 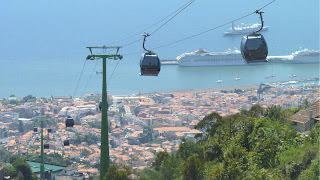 As the gondola lurched over the rollers and the boarding platform disappeared from beneath our feet we looked down on a vast expanse of volcanic rock, a blanket of spring wildflowers and a sea of red tiled roofs. It was magnificent and beautiful and frightening all at the same time; sorta' like watching the man-eating sharks at Lisbon's Oceanario . Long ago, Madeira came close to having its own airline, when the British-owned Aquila operated a float plane service here until 1958. At the Madeira Story Center, you can still sit in the comfy airline seats and remember the good old days of air travel. Now, a number of economy carriers, along with the Portuguese airlines TAP and SATA bring mostly European tourists to the island. But in my opinion its a treasure waiting to be discovered by Americans, and anyone who likes their vistas high-altitude and just a touch scary. Christine, what a pleasure to meet you! Thank you for your company and all the best to you. 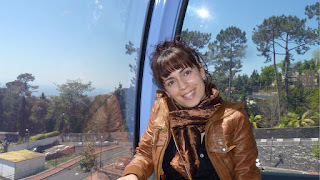 Congratulations for the blog. Looks amazing! Would you believe me if I told you it wasn't an electronic camera? No? Didn't think so. In that case I am busted. But, one mitigating factor, we were on approach, not departure.